It's official, after 21 years of waiting, Los Angeles finally has an NFL team. The NFL owners voted 30-to-2 in favor of the St. Louis Rams to relocate to Los Angeles where they will construct a stadium in Inglewood, CA on the site of the former Hollywood Park Casino and Resort. The San Diego Chargers, who were partnered with the Oakland Raiders on a stadium project in Carson, CA, had their project voted down during the long negotiation process. As a consolation prize, the NFL has agreed to give both teams $100 million towards a new stadium project in their current home markets. The Chargers were also given the option of working out an agreement with the Rams to share the facility in Inglewood. The Chargers have exactly one year to decide if they are going partner with the Rams, or pursue a new stadium in San Diego. If they choose to remain in San Diego, then the Oakland Raiders will have an opportunity to return to Los Angeles as well. 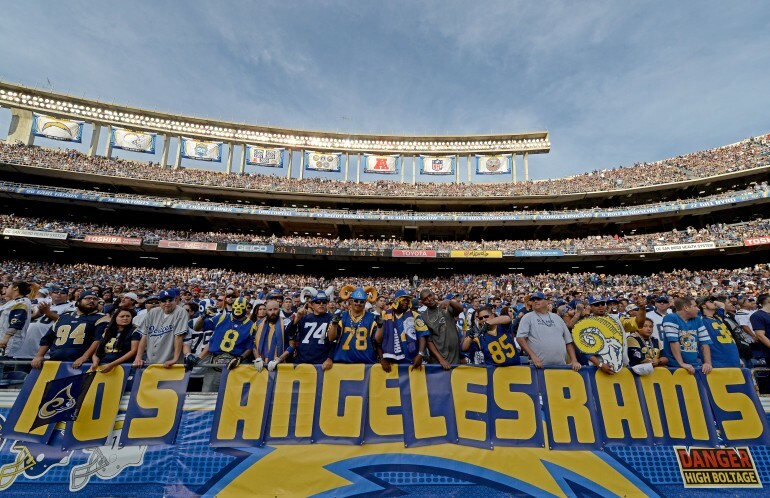 "I will be working over the next several weeks to explore the options that we have now created for ourselves to determine the best path forward for the Charges," said Chairman and Owner Dean Spanos. "Relocation is a painful process," said NFL Commissioner Roger Goodell. "It's painful for the fans, for the communities, for the league in general. In some ways it's a bittersweet moment because we were unable to get the kind of facilities done we wanted in their markets." Meanwhile, the Rams return home to Los Angeles where they spent nearly 50 seasons from 1946 to 1994. They will relocate immediately, and play the 2016 NFL season in the Los Angeles Memorial Coliseum, currently home to the USC Trojans football team. Their new, $1.8 billion facility in Inglewood is expected to open in time for the 2019 season. "Today, with the NFL returning home, Los Angeles cements itself as the epicenter of the sports world," said LA Mayor Eric Garcetti in a statement. "We cannot wait to welcome the Rams and perhaps others soon, as they join a storied lineup of professional franchises, collegiate powerhouses, and sports media companies." See The Designs Of The New NFL Stadium In Los Angeles!